A fine oil on canvas by Harold Harvey which depicts a portrait of Clara. It was painted in 1922. 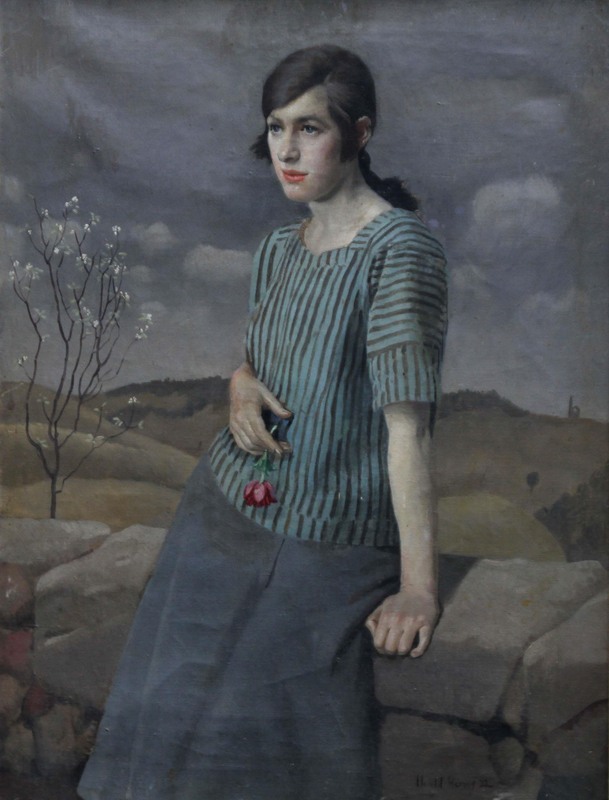 It is a super portrait oil painting which depicts a full length portrait of Clara, looking deep in thought, holding a rose with a tree in blosson behind. Framed 30 inches by 24 inches. In excellent condition. Harold Harvey (1874–1941) was a Newlyn School painter who painted scenes of working class Cornish fishermen, farmers and miners and Cornish landscapes. He was born in Penzance and trained at the Penzance School of Arts under Norman Garstin and the Académie Julian in Paris (1894–1896). Harold Charles Francis Harvey was born to Mary Bellringer Harvey and Francis McFarland Harvey on 20 May 1874 in Penzance. His father was a bank clerk. During his youth, he was home schooled. In 1896, he studied at both the Académie Delecluse and the Academie Colarossi. Prior to 1911, Harvey lived in Penzance. In 1911, Harvey married fellow artist Gertrude Bodinnar. They first met when Gertrude posed for Harvey. She discovered that she had artistic talent and became an artist in her own right in a wide range of visual and textile arts. The married couple lived in Newlyn at Maen Cottage. Friends of the Harveys included Laura Knight, Harold Knight, Annie Walke, and Father Bernard Walke of St Hilary Church. Late in his life, he converted to Catholicism. After completing his schooling in Paris, Harvey returned to Penzance and began working with Norman Garstin. His works included landscapes and life settings of his native Cornwall, religious themes and interiors. He used oil and watercolour paints. From 1909 to 1913, he was an Associate of the Royal Cambrian Academy of Art, Conwy and, in 1910, he was a member of the South Wales Art Society. From about 1910 and into the early 1930s, he was a member of the Newlyn Society of Artists, particularly with artists from the Lamorna valley. 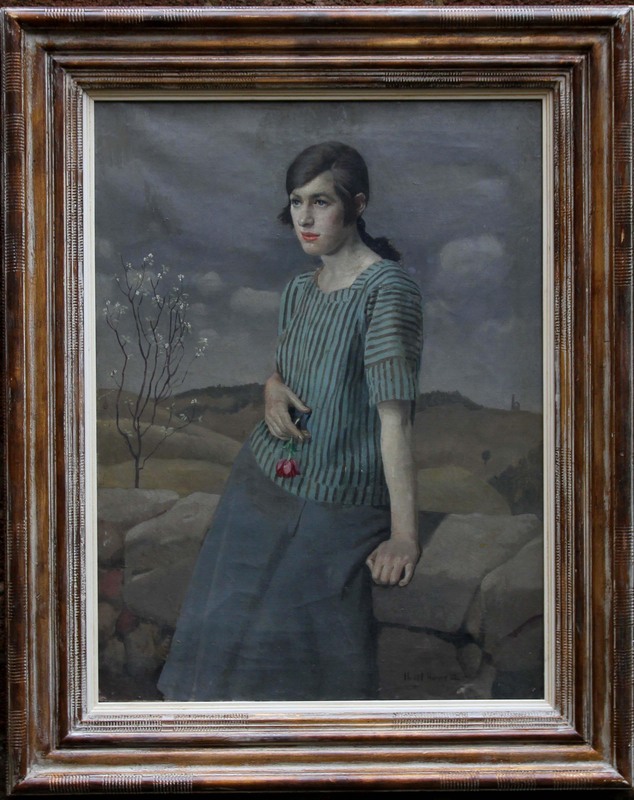 In 1920, Harvey and his best friend Ernest Procter established the Harvey-Procter School in Newlyn, Cornwall. He died in Newlyn on 19 May 1941 and was buried in Penzance at the St Clare Cemetery. Gertrude lived in their cottage until 1960 when she moved into a St Just nursing home. She died six years later.